Julie's Venetian Courtesan: Bead-dazzling. And FINISHED!! I went to the bead store in the city yesterday. Yes, the one that our trio didn't make it to last time round. And just to redeem myself, my concerns were correct--all parallel parking. None too fun on a hill and in a stick shift with no power steering. Still, I braved it and ventured forth. It was an entertaining store, and they had quite the selection, but it was pricey and my heart wasn't in to it at that particular time. 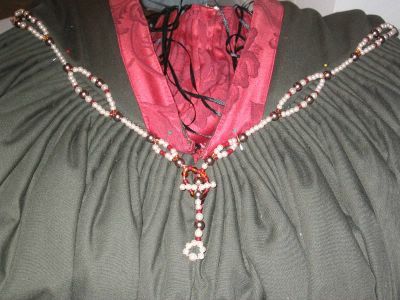 I left with 2 strands of pewter colored glass pearls and some matte czech glass beads in the darkest red I could find. Then I went to the famed "trim" store and got some cheap plastic pearls in ivory along with the gold cording that's currently functioning as the drawstring on my purse. Stringing my pearls yielded this girdle. I didnt' put much design thought into it actually, and I didn't have the peach pearls I was so keen on (they were too $$ in the store, but now I kinda wish i'd just splurged). 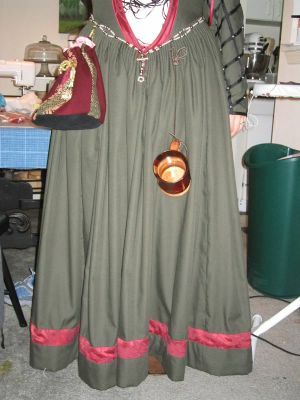 Still, I think its nice enough, and I will try to make a fancier one for my orange dress. Its strung on copper beading wire, and I'm not really sure what happend with that front claspy bit, but its functional. Kinda religious looking, too, I guess. I attached the girdle to the dress at some key locations so that it would conform to the points (beth's idea). The pic has them pinned down, rather than sewn. I got impatient. Oh, and since I was fiddling with the waist of my dress, I attached the utility loops to carry my accessories. Here's a pic of them in action with my purse and cup. I'll likely add a flag fan to that group, and I'll still have one extra loop in case I think of anything else. Oh, and in this pic you can see the way the hem turned out, and the beginning of how the sleeves look with pearls on the intersection. I'm calling this done. Sure, there are pearls left for sleeves, but that is a carride chore for when hubby drives, which is fairly often. I have NOT one single fiddly bit left. This dress is FINITO!! Tomorrow I start working up the orange. Huzzah! Good job. I really like the pearl bits on the arms, the hem, the girdle, etc etc etc. In short, all of the fiddly bits. Yes, ORANGE! I started the bodice lining last night. It is giving me hell. Slippy silk lining, while pretty, is quite the tush pain. Hopefully will have some non-crap results soon. it will work....i have the utmost faith in you!